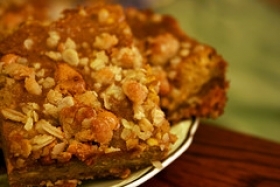 Have you made Butterscotch Walnut Bars? 1. CRUST: In bowl mix flour, salt and sugar. 2. 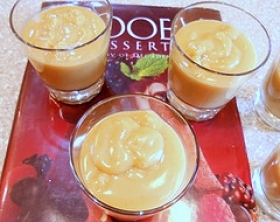 With pastry blender cut in butter until mixture resembles coarse meal. 3. Spread mixture evenly in greased 13 x 9x 2 inch pan, then with hand press firmly into smooth compact layer. 4. Bake in preheated 375 degree oven about 12 minutes or until lightly browned. 5. Remove pan to rack while you prepare topping. 6. 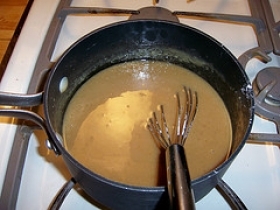 TOPPING: Combine syrup, butterscotch pieces, salt, butter and water in large heavy saucepan. 7. 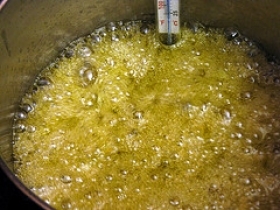 With rubber spatula stir over low heat, pressing butterscotch until melted and smooth. 8. 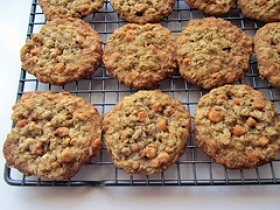 (A few tiny un-melted pieces of butterscotch are all right). 9. Quickly stir in walnuts and remove from heat. 10. 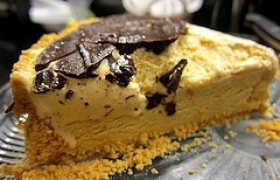 Working quickly to prevent mixture from hardening, place large spoonfuls on warm baked crust. 11. With back of spoon spread mixture to within 1/2 to 3/4 inch of crust edges (during baking, topping will run toward edges). 12. Bake in 375 degree oven 10 minutes. Cool in pan 30 to 40 minutes or until only slightly warm. 13. With small sharp knife loosen around edges, then cut in 16 bars. 14. 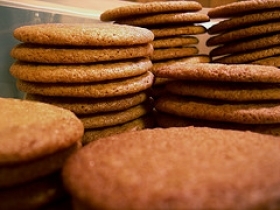 (Bars in center of pan will appear too soft, but they will become firm as they cool; wait to remove them). 15. With wide metal spatula transfer bars to cutting board; cool thoroughly until firm.